Whenever I think about Father’s Day Feasts, I can’t help but think of grilling. To me foods cooked on the grill just speak to me of “man food” with giant steaks and burgers searing on an open flame. Can’t you just smell them already? 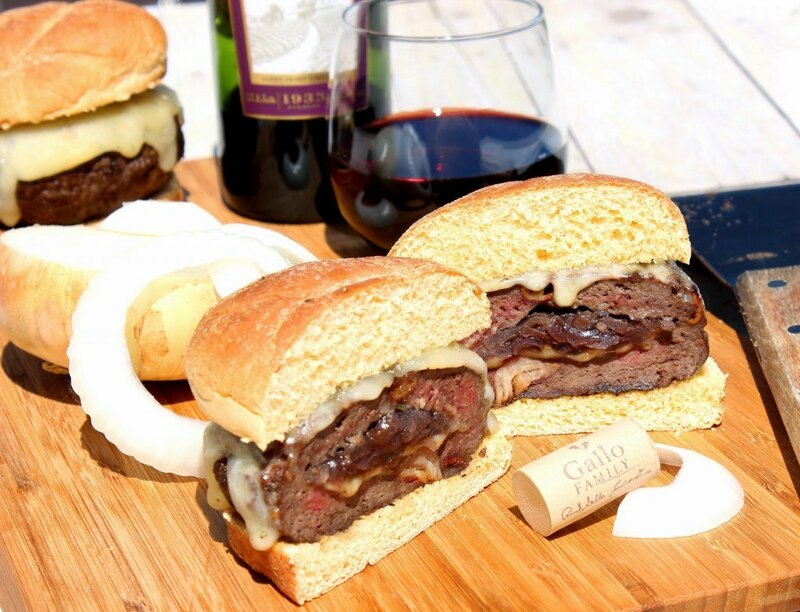 What makes these burgers so incredibly unique and flavorful is the caramelization of the onions in the Gallo Family of red wines, and particularly in this recipe with their Pinot Noir (and a splash or two in the ground beef itself). To me, the Gallo Family Vineyards Pinot Noir has a superior rich, almost buttery taste that lends itself incredibly well to the deep, smooth and mellow flavor of the onions after they’ve been allowed to reduce and intensify their sweetness. 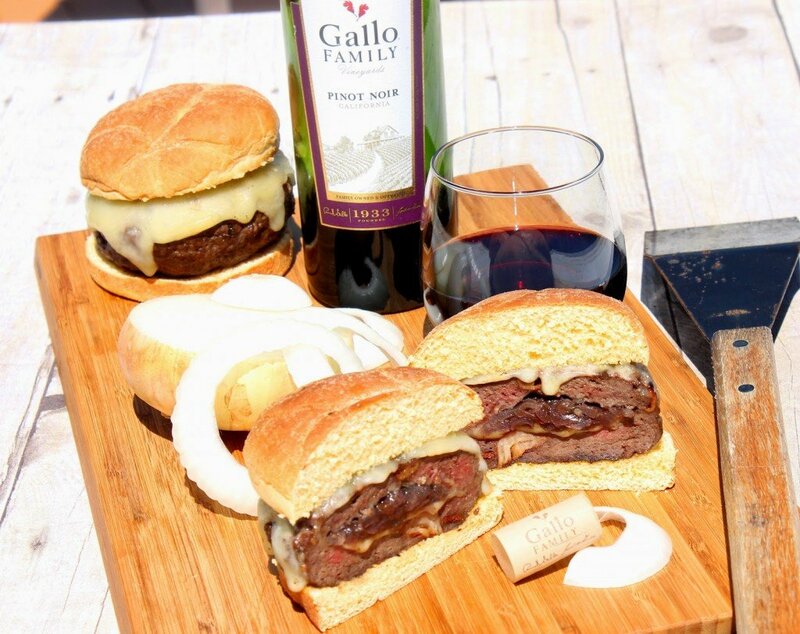 The pairing of the onions and wine is truly outstanding, and they’re a great compliment to these big, bold man-sized beefy burgers! -In a large skillet over medium/high heat, sauté the onions in the butter until they start to get soft (approximately 2-3 minutes). -Stir in 2 tablespoons of the Pinot Noir, 1/2 teaspoon salt and 1/4 teaspoon pepper. Continue cooking while stirring occasionally. -Stir in the chopped thyme leaves. -As the onions continue to cook down, add 4 more tablespoons of the Pinot Noir (2 tablespoons at a time), until the onions have cooked completely down, are very soft and have become a deep red color *Note – This should take approximately 20 minutes. -Remove the onions from heat and cool completely. -In a large bowl, mix the ground beef along with remaining 1/8 cup Pinot Noir, 2 teaspoons salt, 1 teaspoon pepper, the bacon and the garlic powder. -Scoop out approximately 2/3 cup of the ground beef mixture and form 9, 5″ round patties. Place the patties on 2 parchment lined baking sheets. -Top each patty with approximately 1 tablespoon of the Pinot Noir caramelized onions and on top of that, 1 tablespoon of the shredded Gruyere cheese. -Form another 5″ patty from the remaining ground beef mixture and place it on top of the onion and cheese topped patties. -Press the edges of the two patties firmly together with your fingers so that the filling does not ooze out during the cooking process. -Preheat the grill to medium heat (I use a gas grill but if you’re using charcoal, make sure the coals are evenly distributed throughout the grill surface and not flaming hot). 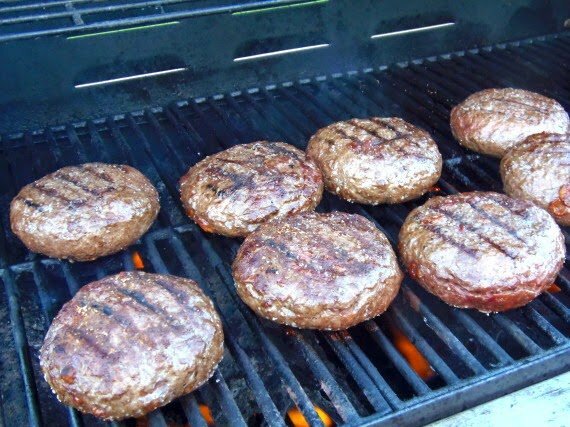 -Place the man burgers onto the grill surface and allow to sear uncovered for approximately 10 minutes. -Gently flip the burgers and continue to sear the other side uncovered for another 7-10 minutes. -Place the cheese slices on each burger, cover, and allow the cheese to melt (approximately 2-3 minutes). -Place each man burger on a bun and top with your choice of condiments (or eat plain as I did to experience the full flavor of the pino noir running throughout the entire burger). *To find out where to purchase one of the many Gallo Family Vineyards fine family of wines, please click here for a store locator near you. *Click here for your $1 off Gallo Family Vineyards digital coupon. *Learn more about the family behind Gallo Family Vineyards. Please note that all the opinions I’ve shared of the Gallo Family Vineyards Pinot Noir are strictly my own. I have not been influenced in any way by Gallo Family Vineyards. That said, this is an exceptional wine and one I gladly choose to drink on my own, either by itself, or in a fabulous recipe. 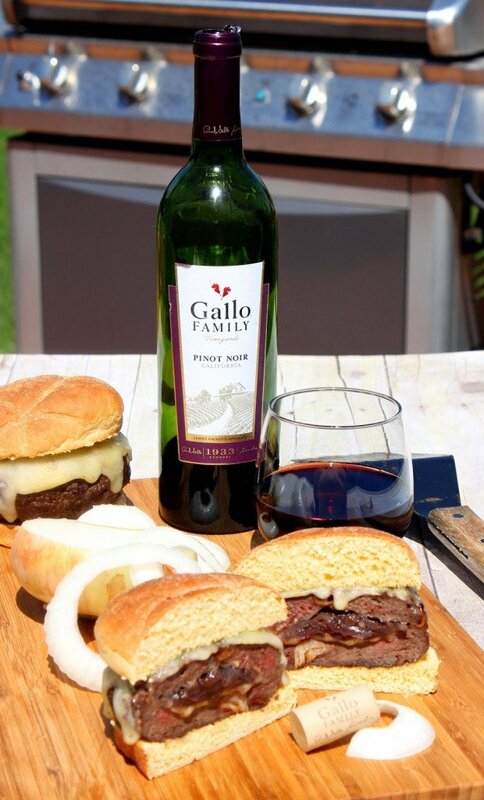 Speaking of fabulous recipes including Gallo Family Vineyards wines, please click on all the links below as the #SundaySupper team celebrates, Father’s Day Feasts, and of course Gallo Family Vineyards! Let’s make Father’s Day a big deal this year by cooking some of our favorite dishes and pairing them with great wine! Cheers to a very Happy Father’s Day! Seriously awesome burgers Renee. I love caramelized onions and Pinot Noir. Stuffing them in a burger is simply genius. That top photo instantly made me want to go grill burgers … and it's only 5:45 in the morning. 🙂 Great choice for Father's Day. Looks delicious. Nothing says Father's Day more to me than grilling!! love these man burgers!!! so perfect! WOW! Those are some nice fat burgers! So perfect for Father's Day! I am loving this recipe! The name "man burgers" cracked me up! But what delicious manly burgers these are! I would love to bite into this and be surprised by this filling! Forget man burgers – I'd definitely take one or two of these delicious looking burgers! You managed to include every single favorite burger ingredient into ONE amazing burger! I can't wait to make these!! This is my kind of burger! In fact, it kind of reminds me of the meatballs I made for today's #SUndaySupper! You have made man burgers but I do believe a few females might swoon over your creation, too =) Thank you for sharing the delicious how-to! Oooh my! The stuffing in these burgers is to die for! Definitely a manly burger, for sure! These look incredible!! 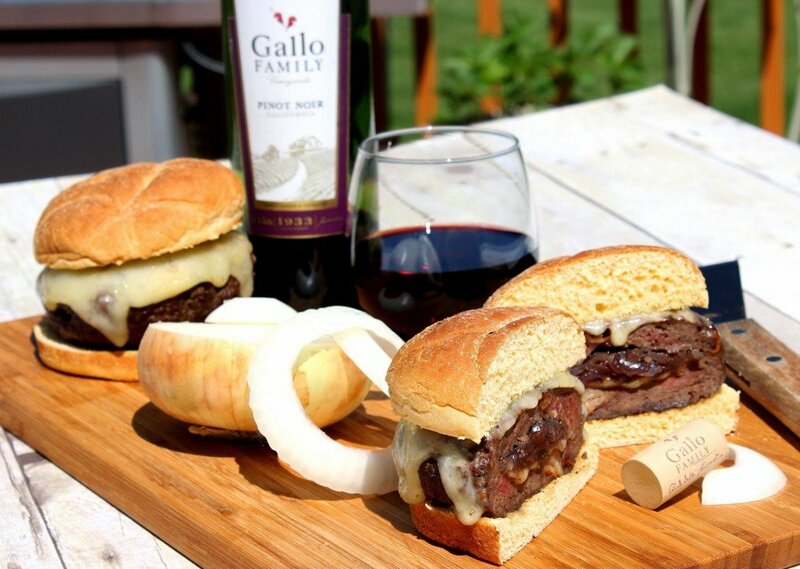 What a wonderful take on the classic caramelized onions by adding Pinot Noir! YUM! I had to read that title twice, just to make sure I read it right. Holy moly, burgers. These look and sound amazing! My mouth hasn't stopped watering! One thing is stuffing burgers with caramelized onions – Another is caramelized onions with pinot noir! The smell must have been AMAZING!! "man burgers" hahaha! I love it! I could go for a big fat juicy burger right about NOW. These man burgers would make my man weak in the knees! Love the sound of all those ingredients into one giant burger! Wow! Your wine infused caramelized onions sound amazing! Those are some amazing burgers! I haven't decided yet what I'm going to do this Sunday, but this is a great idea! Oh I bet those onions make this amaaaaazing! Now those are some manly burgers! I am trying these thank you thank you! I bet anyone in my family would LOVE these! Yum! Oh My Lanta! What I wouldn't do for a bite of one of those burgers! That looks like a happy father's day! My husband is a stuffed burger connoisseur, and I know he would just LOVE these. But honestly, with all that tasty goodness you have going on here, who wouldn't love them! YUM! Oh yeah, these are some serious burgers! This would definitely make dad happy.